We seek to have kids understand that the Bible is very relevant in today’s world and the stories therein still apply. The challenges that kids face in school—bullying, the occult, peer pressure, gossip, idolatry—are all the same challenges faced by Bible heroes, including Jesus Himself! Kids who use our materials consistently will find the Bible a very comforting, relevant and understandable place to find help. 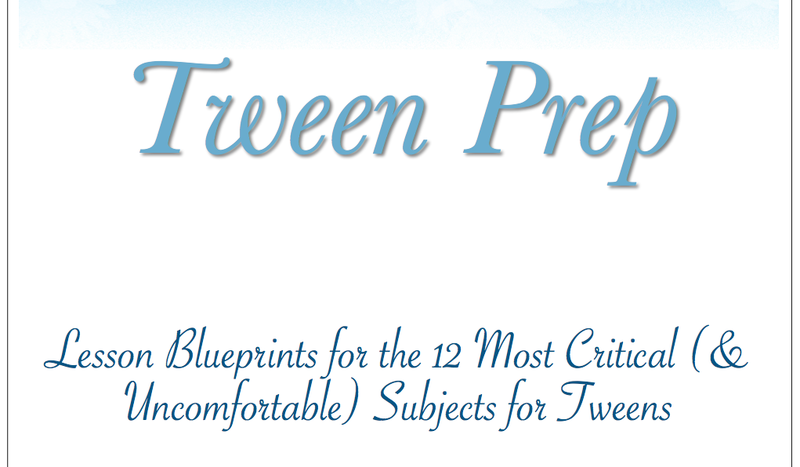 While they have a plethora of programs to choose from, we took a look at “Tween a Rock and a Hard Place” Lesson Blueprints and Freedom Ride: 12 Lessons of Faith for Today’s Teens. Wise therapists offer a bit of advice that often surprises families: Anything you want your children to know about spirituality, morals, ethics and general good behavior, tell them before the age of 12. This includes information about some of the hardest hitting subjects that parents stumble over or fear, including drinking, drugs and sexual behavior. This seems to be very true. Having survived parenting a tween once, and now being in the throes of it with two children simultaneously, I can say that it is not easy on any of us. I think we are very blessed in that they go to a school that is reasonably sheltered - they're not naive enough to believe that kids are ignorant of the world, but try to keep life as age appropriate as possible - and that has meant they are not growing up too quickly. But as much as I'd love to keep them kindergarteners forever, that's just not possible and they are going to to have to learn to handle themselves in the real world. The lessons in this book to provide a way to discuss important values with your child. This PDF syllabus costs $29. and comes with two files - a "text" book that can be used by a group leader, and then a second "parent and teacher" guide on dealing with today's tweens. This second text is a great addition because life just is different now and it helps adults to better relate and interact in a way that will engage rather than push away tweens. Freedom Ride: 12 Lessons of Faith for Today's Teens is for high school students, who are faced with greater challenges to their faith. It can be difficult to balance the intensely private natures of the teenage years and faith with the cacaphony of outside influences. This program helps teens shift from religion being something taught to them on Sunday to faith being something they practice daily. They learn how to use their faith as a yardstick to make decisions. This PDF, also $29., is geared for the youth group leader. It also helps them to understand that God isn't being the "Heavy." He isn't giving us rules to keep us from having fun or living a full life. Perhaps when the teens were younger, clear rules were what they needed, because they needed boundaries. Younger children tend to do well with "Because I said so." But as they get older and life isn't so black-and-white, the answer to that becomes a snarled "Well, who put you in charge anyway?" This program enables faith helps guide them through the grey challenges. One particular concept I LIKE about the program is it encourages the participants to use real-life scenarios and items (parties, social media, cellphones, etc.) as tools that can enhance their faith. Again, showing that real life isn't black or white -- something like Facebook isn't inherently evil, it's how it is used (and how you behave!) that makes it one extreme or the other. While biblically based, each program is less of a Bible study and more of a critical thinking program. Both of these programs are intended to span 12 group sessions. They would be ideal for dedicated weekly or monthly youth group meetings, rather than as part of a Bible study session, as each lesson is expected to take about 60 minutes between the introduction, class teaching and discussion, and then small group discussion. This leads me to where this program fell a little short for us. One teen or two tweens does not a youth group make. Also, when Mom is the person leading the discussion and it's more of a 1:1 rather than "Anybody but my parent in the front of the room and other kids who will talk first," it sometimes makes it a little awkward to discuss things freely. I think it would be much easier to keep the communication going at home after a group meeting, where the parent can say, "Oh, I saw the agenda said you were discussing <this concept>, how did it go?" or "What did you think of..." where there would be more to talk about than just the chapter's topic. Most teens and tweens tend to open up when they don't feel so "stared at." (Proof that God sends you Guardian Angels: I can't tell you how many times I have nearly crashed the car when somebody has asked a "tough" question seemingly out of nowhere. Clearly, it's been percolating in his or her mind, so it makes perfect sense to ask it at that moment and catch Mom off guard.) While I would highly encourage parents to be involved and know what is being discussed, these programs are definitely something better facilitated by a co-op or church-based youth group rather than as family. Outstanding Object Lessons, Bible Science Experiments, 100 Simple Service Projects, Daily Dilemmas: 26 True-to-Life Devotions for Kids, "Tween a Rock and a Hard Place" Lesson Blueprints, Bullying & the Bible Lesson Plans, KidMin Power Pack, Bible Memory Games, The Divine Dozen: 12 Parables of Jesus Every Child Should Know, Make & Take Bible Crafts, New Testament Life Lessons, Fruits of the Spirit Activity Kit, 10 Commandments Activity Kit and Lord's Prayer Lesson Pack. Members of the Crew reviewed all of these, so click through on the banner to find out about all of these other activities!